Are you up to your eyeballs in lesson planning? Or maybe you’re avoiding them all together? I’ve been in both situations over my 15 years of homeschooling. 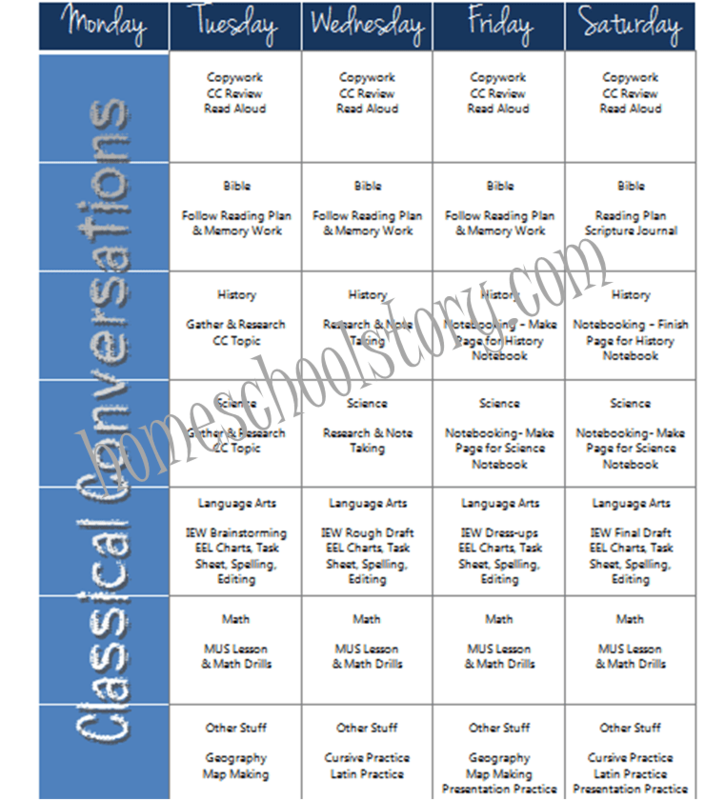 I’ve included my favorite lesson planning systems that I’ve used through the years. Although I gave up on using these at different times, I consider them all valuable for different seasons in life and different ages of kids! Maybe one of these ways, or a combination of ideas, will give you the EASY lesson planning idea you need! About 9 years ago, I threw out my “teacher lesson plan book” and started finding something easier. That’s when my journey began! For awhile we used Workboxes. It was a good switch. We loved it…for awhile. I learned a lot by using the workboxes and I’m glad I did it. Workboxes are a system of tasks/assignments that are visual and tactile. 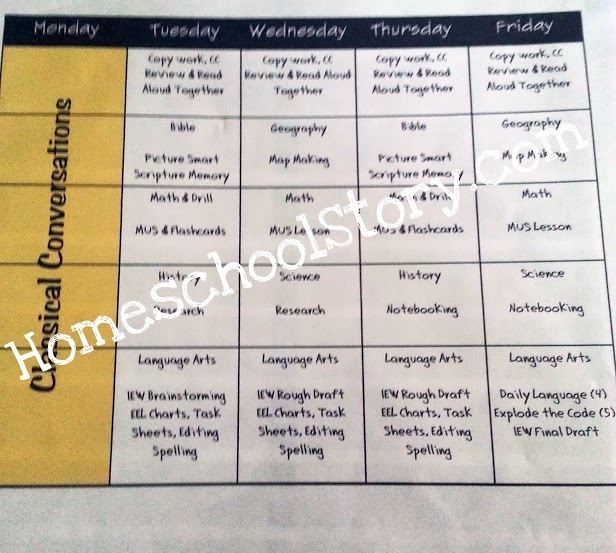 If your kid needs to SEE what his/her day LOOKS like and you need to create a more independent student, this is a great idea! Basically you get a shoe organizer and 12 clear, plastic shoe boxes per child. (Check Target/Walmart/Dollar Store for best prices). When I found out about workboxes, I was completely obsessed with finding out more and more. Google helped me find and read every blog out there that had anything to do with workboxes. I bought the ebook from Sue Patrick’s website and read it through. Next, I went right out and got the boxes and the shoe rack thing to hold them. Although I loved the system, I did make a few alterations to the system to make it work for me and my 2 children…but they were awesome! My son (9) loved the workboxes. It was because of him that I was even looking for something to help us. He had such a distaste for school and I knew I had to make some changes. The workbox system allowed him to see his whole day at a glance. He instantly knew what was expected of him and when the school day would be over. It also forced me to make sure that I was including some fun learning parts to our day and not make things so dry. My daughter (5) also loved it. She would go through her boxes like a pro! And boy did she love all the fun independent activities I would find for her boxes. She was very good at following the system and marking her chart and stacking up the “done” boxes. There were so many aspects to the system that I loved, that some are surprised that I stopped using them. I think all things are here for a season and my season was just over I guess. I learned so much from the system that will always be with me as a homeschool mom though. In the end, space was a big factor. I needed more bookshelves and it just wouldn’t all fit! But also, no matter how many times I tried to figure something out, the planning was just taking up too much time. I had to find a better way. You and your child can easily see what needs to be completed each day It forced me to make sure to include some FUN activities each day! I liked the look of all the shoe boxes lined up nice and neat! I found myself coming up with busy work just to fill the boxes. In the end, it wasn’t the forever plan I was looking for, but it helped me on my journey. Then I made a flexible planning system that used baseball card holders. Instead of a box for everything, I used the pockets in the baseball card holder sheets. Basically you use index cards cut in half and write their subject or assignment on the cards and slip it into the card holder. Just like the workboxes, everyone can see what’s expected for the day…all in one place. As they finish their assignments, they can either take the card out, or just use an EXPO marker to cross it off! Easy-breezy! The way I made it was to write the subjects on the cards and leave the bottom of each card blank. Then you can use an EXPO marker to write details about each subject. They can cross off or erase them as they complete them. I loved that it was so visual. You can actually make one page for each day and have it all set up for the whole week. For example if on Monday and Wednesday you do Science and Tuesday and Thursday is Art, you could have the cards in each day’s page ready to go based on your routine for each day! 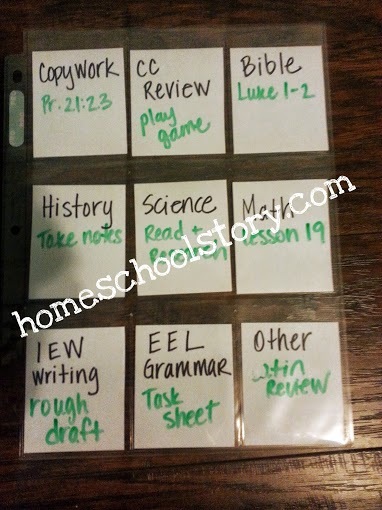 The other option is just one page per kid and you just insert the subject cards as you need each day. I recommend that you use the WET erase markers rather than the EXPO though. The dry erase will just come off to easily. You can see that the tasks aren’t so detailed. The subjects that just move from one page/lesson to the next are easy…just write “Do 1 Lesson” or “Complete 2 Pages.” Items that have specific tasks can be written out…like my IEW Writing square – it says “Rough Draft” because that day we worked on the rough draft. I don’t need to write the page number in the workbook or the topic….we already know that or it’s marked in her book. Just keep it simple enough but clear enough that they know what to find and get done! These can be put in a binder, placed on their desk, or even hung on a wall! This is a BIG Favorite of mine…but eventually we went to the Checklist Method…. Simple and easy for independent work, child doesn’t have to wait on you! Flexible – if your day gets crazy, just move cards around, or keep them in place! This remained my favorite way of organizing our plans for the week, and I believe it’s the easiest so far! Basically I took the baseball card idea and just made it permanent. You can still cross off each item if you either laminate the chart or put it in a sheet protector. Here you can see my first version.. I’ve made a few changes along the way, but mostly just due to my kids getting older and doing more school work. The Checklist Method is simply just thinking about what you actually need to get done in a week. Make a list of what subjects and how many lessons need to be done in those subjects. That will now be your weekly lesson plan for the year!! WHOO HOO! “But where does it tell me the page numbers and lesson numbers?” you ask. Well, it doesn’t. Most subjects just move from the front cover to the back cover. I just use a book mark that we move as we work. Math….go to the next page. Spelling…start your list, work your list, move forward. There are some subjects that don’t work like that. History and Science are two of them for me. Since we don’t use text books for these subjects at this point, we can’t just move to the next chapter. In those cases, I have a master list of our topics and I just put post it notes as bookmarks to show where we will be reading from. I can easily do this for the entire semester or year in about an hour per subject! Overall, I think that while they each take a different amount of time, they have all served their purpose in saving time with long term lesson planning for me at different stages. The Working Squares and Checklist Methods are my absolute favorite way of planning, but a younger child would love the workboxes more! Maybe you have a young child that would benefit from workboxes, while your older children would like the Working Squares or Checklist Method! Then just use both! That’s the joy of homeschooling! So true that you don’t need to plan each assignment for every day ahead of time. The great thing about that is that you don’t get off track when you can’t do school one day…you just pick up where you left off. Thanks for sharing your experiences with these different ways to plan! Wow! I thought I was weird for doing something very similar. I love the checklist. It is working very well for me. It does help with accountability and seeing what has or has not been done! Rachael, Yes! I love simple tools that keep me on top of things! Hope you had a great Christmas!